Resizing photos and reducing their size is common routine for number of users. There are number of ways to reduce size of images like using right click procedure or batch resize mode for large number of photos. If you deal with images all the time and are on constant move, then checkout free portable ‘Image Converter’ software to resize photos on the fly. 1. 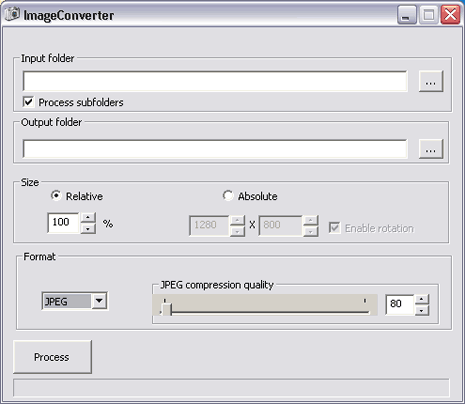 Download Image Converter program on computer. 2. Unzip downloaded file, double click to launch the program. 3. Select the Input and Output folder for images. 4. Select size, output image format, JPEG quality for resizing process. 5. Click Process button for quick resizing of photos as per specified settings. For sure an easy to use image resizing program and it is fully portable (carry it anywhere in USB drive). Like it? Who uses these tools? There are tons of them. But just about any image viewer you have will allow you to resize within the program. This one won’t even batch process. Do programmers do this as an exercise for their first program?, or try to make a program that looks like a Windows 2 program? Or is it a sort of blog filler?